Goa News |Is Rajdeep coming to Goa as CM-candidate of AAP? 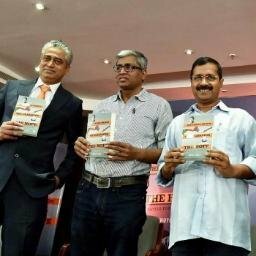 Is Rajdeep coming to Goa as CM-candidate of AAP? The rumour is authenticated by Goa’s oldest English daily The Navhind Times, but he personally refutes it. Rajdeep Sardesai, Goan-origin ace TV journalist of India, dismissed the rumour at an interview held at Lokmat award ceremony today evening. The Goa edition of Marathi daily honoured him today as Icon of Goa. “I am prepared to come to Goa to become the chief minister if people of Goa want. But I don’t think they would want me to quit journalism”, said consulting editor of India Today TV. According to him, a journalist cannot enter politics without quitting journalism for ever, unlike other professionals like lawyers, doctors etc. “I have no plans to quit journalism, thus there is no question of joining electoral politics”, said Sardesai, son of a veteran Indian cricketer of Goa, Dilip Sardesai. The rumour is on in the background of AAP searching for a face to project in the forthcoming Assembly election. Dr Oscar Rebello, a celebrity social activist who has joined AAP, has refused to provide the face to Goa AAP. “Nothing can be imposed from outside, neither the face nor the party”, says Sardesai, while speaking about AAP. According to the leading political analyst, any political entity has to emerge from within the local soil with grassroot level activists. Replying to the question posed by Raju Nayak, local editor of Lokmat, Sardesai dismissed the thought of him joining active politics. In a lighter vein, Sardesai also observed that people of India have started preferring single man or single woman as their leader, may it be Mamata Banerjee in West Bengal, Jayalalita in Tamil Nadu, Sarabnanda Sonowal in Assam or Narendra Modi at the centre. “I am a family man. How will people accept me as the CM in such a situation”, he asked while the gathering at Kala Academy burst out laughing. Incidentally, AAP is having its public rally tomorrow evening, to be addressed by Delhi chief minister Arvind Kejriwal. AAP is promoting professional people with honest characters as its leaders. AAP is introducing a new form of political environment in the country. Transparency level of Delhi Government of AAP is very high. Despite obstacles by Union Government, it has achieved remarkable outcomes through its pro-active nature of governance in Delhi. Its leaders are always connected with the people. People of Goa must provide an opportunity to AAP to form next government in the state for speedy and all round development. He is thinking much 'BIG' about him then actually he 'IS'. Will AAP-type factors hamper the Congress, or the BJP? Will the silent voter decide the fate of candidates? Is MGP heading for a break-away from the BJP?